I’ve worked as a magazine editor and writer for most of my life. When I started gardening in 1991, I had no idea that my hobby would take over my life, eventually turning into a garden-writing and design business. Once I had my business started, I needed a web site. I began with a free site provided by my internet server and designed by a friend who knew html. The trouble was that every time I wanted add something or update my site, I’d get something wrong and have to bother my friend. And, of course, unless I gave people the web address, there was no way they would find me on the internet. My site-building frustrations got me searching for a better way. I finally found it with Site-Build-It, which I heard about from another garden writer who had created his site with it. I began working on my site in late 2003 when a major national magazine client and I parted company. My goal at first was simply to replace the earnings from that client by creating a site with small ads on it. But these days – using Google’s Adsense program and affiliate links – my site earns more than all my magazine writing combined. As a writer, it’s been a liberating experience to become my own publisher! I don’t think I could have done that without Site-Build-It. When measured by visitor numbers, my site is ranked in the TOP ONE PERCENT of the internet. 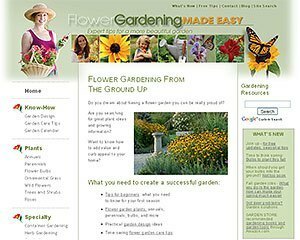 You’ll find Flower-Gardening-Made-Easy featured in this selection of real world sites. At the heart of SBI! is an Action Guide, tools for brainstorming site topics and keywords, design templates (no html experience necesssary), and solid guidelines for organizing site content in search-engine-friendly ways. Invaluable too also a lively forum of fellow web-builders, who help each other out with information and inspiration. If you want to learn more right now about the process that I went through to build my site, grab a coffee, and watch this detailed video of the SBI! site-building process. Yes, creating an effective web site takes time, work and dedication (but, you know, it’s also a lot of fun). Well, actually besides teaching you how to build a successful website, SBI! also shows you how to write compelling and readable content. Ken Evoy, the company founder, wrote an e-book called Make Your Words Sell, all about how to write for the web. The book has always been available free to SBI! subscribers, but outsiders had to buy it. However, it’s now a free download for anyone. Bottom line: I recommend Site-Build-It because it gives you so much more than site-building: it teaches you how to create a business online. Just remember, like starting a garden, building a web site takes time. Remember, no garden or web site gets created overnight. For me, the best thing about the program has been having my own internet coach to walk me through all the steps of web site and small business creation. After all, I’m a garden writer and photographer, and not a computer or business expert. I joined the SiteSell affiliate program because I really believe in the product, and I wanted to recommend SBI! to my site visitors and friends. So, I have no qualms about recommending Site-Build-It to you. I know it actually works. If you buy through any link on this page, you can start your own online business, and I’ll receive a small commission that helps to support this website. Thank you in advance, and I look forward to meeting you in the SBI! forums. PS: If you buy SBI!, it’s completely risk free. SiteSell.com will give you a FULL refund if you decide that it’s not right for you. More real people who built successful web businesses with SBI!